Sein Than. Sein Than, a community leader, was arrested on 31st July 2014 for protesting without government permission. He was charged under Article 18 of the Peaceful Assembly Law. He was sentenced to two years in prison and he is currently serving his sentence in Insein prison. Human rights defender Ko Htin Kyaw is the director of Movement for Democracy Current Force (MDCF), a community-based organisation working to promote development and democracy in Burma. He was arrested on 5 May 2014 in South Okkalapa Township in Yangon for delivering a speech and distributing leaflets criticising the Burmese government and calling on members of parliament to resign. He was charged under article 505 (b) of the Penal Code for ‘making statements that cause alarm or induce others to commit an offence against the state’. He is being held in Insein Prison in Yangon and faces up to two years’ imprisonment and/or a fine. On 9 May 2014, two of his colleagues, Ko Tin Maung Kyi, deputy director of MDCF, and Ko Zaw Win (a member of MDCF), were arrested when they attended Ko Htin Kyaw’s trial. They too were charged under section 505 (b) of the Penal Code and are being held in Insein Prison. The human rights defenders were charged in connection with the distribution of pamphlets stating that “the civilians are the real masters of the country and the Government is only the servant of the country,” and for reportedly shouting slogans criticising the government’s policy on land-grabbing. Please take action for the release of Ko Htin Kyaw, Ko Tin Maung Kyi and Ko Zaw Win, and all the remaining political prisoners in Burma by writing to the Burmese authorities. A draft letter is outlined below. Ko Htin Kyaw is facing 11 different charges under Section 505(b) for distributing leaflets in 11 separate townships. He has been arrested many times in the past for his peaceful protests. In late 2013, five different courts sentenced him to at least 33 months’ imprisonment on multiple charges under Article 18 of Myanmar’s Peaceful Assembly and Peaceful Procession Law. 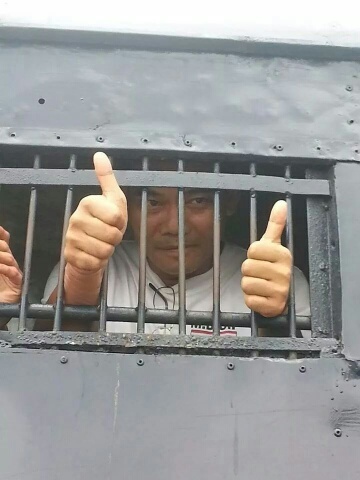 He was released on 11 December 2013 as part of a Presidential amnesty, but was re-arrested and detained the same day, again facing charges under the Peaceful Assembly and Peaceful Procession Law. He was released a few weeks later on 31 December 2013, as part of a Presidential pardon. In February 2014, the United Nations Working Group on Arbitrary Detention found that the detention of Ko Htin Kyaw in December 2013 was arbitrary. The Peaceful Assembly and Peaceful Procession Law is frequently used by the authorities to detain peaceful activists. The UN Special Rapporteur on the situation of human rights in Myanmar, Tomás Ojea Quintana, has also identified Section 505(b) of the Penal Code as one of a number of legal provisions in the country used to detain peaceful activists. He has repeatedly called on the Burmese authorities to amend the Penal Code to bring it in to line with international human rights law and standards. Ko Htin Kyaw, Ko Tin Maung Kyi and Ko Zaw Win are being detained solely for their exercise of the rights to freedom of peaceful assembly and expression. They join a growing number of “new” prisoners of conscience jailed in Burma this year. All must be immediately and unconditionally released. On 5 May 2014 at 11am, human rights defender Mr Ko Htin Kyaw was arrested by the police for distributing pamphlets in South Okkalapa Township in Yangon. On 9 May 2014, two of his colleagues, Ko Tin Maung Kyi and Ko Zaw Win were arrested when they attended the trial of the human rights defender. Ko Htin Kyaw is the director of the Movement for Democracy Current Force (MDCF), a community-based organisation working to promote development and democracy in Burma. He has been repeatedly arrested for his peaceful protests, including in August and December 2013. In February 2014, the United Nations Working Group on Arbitrary Detention found that the detention of Ko Htin Kyaw in December 2013 was arbitrary. On 5 May 2014, Ko Htin Kyaw was arrested and charged under article 505 (b) of the Penal Code for ‘making statements that cause alarm or induce others to commit an offence against the state’, while he was delivering a speech and distributing leaflets criticising the Burmese government and calling on members of parliament to resign. He is being held in Insein Prison in Yangon and faces up to two years’ imprisonment and/or a fine. Human rights defenders Ko Tin Maung Kyi, deputy director of MDCF, and Ko Zaw Win (a member of MDCF) attended Ko Htin Kyaw’s trial on 9 May. There, they too were arrested and charged under section 505 (b) of the Penal Code and are being held in Insein Prison. The human rights defenders were charged in connection with the distribution of pamphlets stating that “the civilians are the real masters of the country and the Government is only the servant of the country,” and for reportedly shouting slogans criticizing the government’s policy on land-grabbing. I am concerned that the charges against Ko Htin Kyaw, Ko Tin Maung Kyi and Ko Zaw Win are directly related to their human rights activities and their exercise of the rights to freedom of peaceful assembly and expression. 3. Guarantee in all circumstances that all human rights defenders in Burma are able to carry out their legitimate human rights activities without fear of reprisals and free of all restrictions. Naw Ohn Hla Naw Ohn Hla is a prominent women activist who has been arrested and jailed numerous times for her political activities. On 15th May, the military-backed government in Burma sentenced Naw Ohn Hla to 4 years and 4 months in prison with hard labour, just for taking part in a peaceful protest. The protesters were urging the Burmese government to investigate the death of a fellow protester in 2014. She is currently serving her prison sentence in Insein Prison in Rangoon.